More than 100,000 rugby fans in Cardiff for Wales' victory over England have been warned to expect travel disruption on their journeys home. 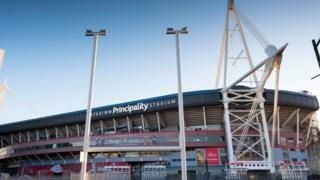 The Six Nations clash, which saw Wales win 21-13, was a sell-out at the Principality Stadium while many thousands more descended on the Welsh capital. A post-match queuing system has started at Cardiff Central train station. Road closures and bus diversions also remain in place in the city centre. A full city-centre road closure lasted until 19:45 GMT. Ahead of the game, supporters were warned to travel early and plan their journeys. The game was the first international match in the city since Severn Bridge tolls were abolished, and saw heavy traffic on the M4 into south Wales. More congestion is expected on the eastbound carriageway - especially around the Brynglas tunnels, near Newport, as supporters head home. Buses have been diverted out of the city centre until 20:00 GMT, with stops moving to Churchill Way for the east, Greyfriars Road for the north and Tudor Street for the west. Earlier in the day, roads including Duke Street, Castle Street, High Street, St Mary Street, Caroline Street, Wood Street and Westgate Street were shut in their entirety. Queen Street train station closed at 18:00 and large queues have formed outside Cardiff Central while the queuing system came into effect. Transport For Wales said there was "limited capacity" on local Cardiff and Valleys routes and it "advises customers not to wait until the last train service to go home". It also urged people to have a valid ticket before boarding any trains.